Any circuit that you build must have a power supply in order for it to work. Duh, right? That’s pretty obvious. Sometimes though, it can be a challenge to find a good power supply that won’t eventually die (like batteries), that is stable (not like a voltage divider), or that is cheap (have you seen how much bench top power supplies cost!). You can always make the case for using a voltage regulator for stable, cheap, and long lasting power, but how do you power that? The 7800 series if voltage regulators requires a minimum of about 2V more supply voltage than the listed output. So now we’re stuck with providing power to that. We need something simple, cheap, and reliable. The new PowerBRICK series is just the right tool for the job. New PowerBRICKS come in 4 different +/- Vout options. 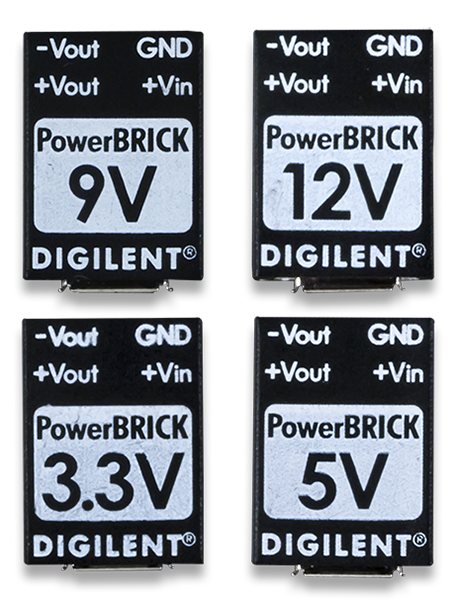 PowerBRICKs provide four different options for powering your circuits: 3.3V, 5V, 9V, and 12V. Each BRICK has 4 pins, spaced just right to fit across the IC channel of a breadboard for easy integration. These pins provide +/- the listed voltage, a tie-in to Vin, and GND. Vin is 5V provided via micro-USB connector to your computer USB port (there is no data connection, just power). The Vin pin is bi-directional, so you can daisy chain several BRICKs together from the same source. For best results each individual BRICK should be powered separately however. If they are chained together, the entire chain can deliver 2.2W of total power. 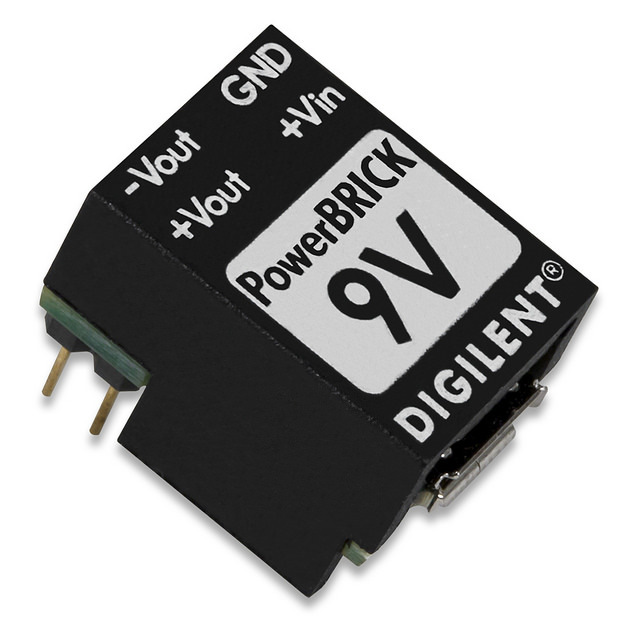 Each BRICK is capable of outputting approximately 1.1W of power, so with some quick math we see that the 3.3V BRICK provides roughly +/- 320mA, the 5V about +/- 200mA, the 9V about +/- 130mA, and the 12V BRICK provides about +/- 100mA. These ratings are for BRICKs powered individually. I was playing around with them the other day and got to thinking about my FM modulation/de-modulation circuit I built a while ago. In order to modulate the signal into an FM signal, I first had to run the signal through a voltage-to-frequency converter, sometimes called a voltage-controlled-oscillator, or VCO. The AD654 VCO available in our analog parts kit was the perfect solution and really easy to set up. So I dug it out and started playing with it to see what I could do with the PowerBRICKs. 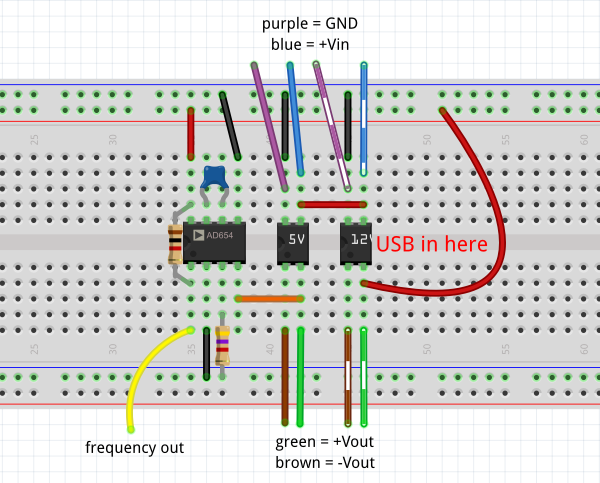 I used the same schematic as the one in my Instructable, but changed some of the values to simplify things a bit. I won’t get into the details of the AD654 function here, but looking at the breadboard image below, you can see that pin 8 (+Vs) is tied to the 12V BRICK and pin 4 (+Vin) is tied to the 5V BRICK. Fritzing image showing the component layout. The purple, blue, green, and brown wires are not part of the circuit and are only there to indicate BRICK pin functions. The AD654 datasheet provides a formula to determine the output frequency based on the input voltage and the RC timing pair. 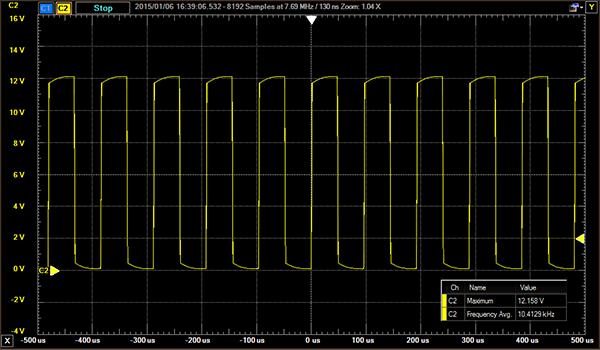 Using a nominal 4.7kΩ resistor and 10nF ceramic capacitor, the output should be 10.638kHz. 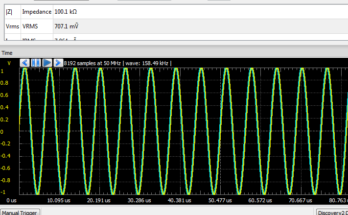 The o-scope image below was screen-captured from the WaveForms software using an Analog Discovery and shows the output frequency to be 10.413kHz, well within %-error tolerances for the resistor and capacitor. Note that the maximum output voltage is approximately 12V, which is the +Vs supplied by the 12V BRICK. O-scope image showing output frequency of 10.4129kHz. PowerBRICKs can be used for any number of projects that need a simple and easy power supply option. Not everybody can afford a bench top power supply, and in the end, who cares where your 12V comes from anyway? PowerBRICKs are the easy, low-cost solution for anybody who needs quick, cheap, reliable power. 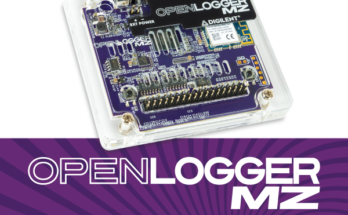 Previous Article Halloween…with Stepper Motors! 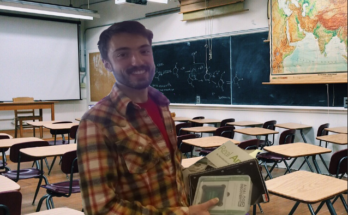 Next Article It’s a Sale! A Halloween Sale!